New Toys! Here is the scoop! Thrillipede is a war hero with incredible piloting skills… and even more incredible juggling skills. Thrillipede served in the Millipede Military in the outer regions of Skylands. As the top pilot in his unit, Thrillipede was responsible for single-handedly blasting over 300 Greeble warships out of the sky! When the Great Greeble War came to an end, he returned to his hometown of Flutter Bay as a celebrated hero. He was the talk of the town and everyone wanted to shake the many hands of the famous young pilot. News of his heroics eventually made their way to Captain Flynn at the Skylander Academy, who set out to determine if the stories were true. In a series of friendly challenges, the two pilots raced, soared through obstacles, and performed incredible stunts in front of a cheering Flutter Bay crowd. In each event, Thrillipede stood victorious, and was asked to join the Skylanders shortly after. Of course, Flynn later admitted that he “let him win” so that Thrillipede wouldn’t be embarrassed in front of his hometown. 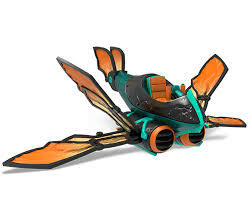 Buzz Wing is Thrillipede’s famous fighter plane. After heroically blasting over 300 enemy jets in the Great Greeble War, it was put on display in the Millipede Museum. But with Kaos on the loose again, it’s back in action and ready for more!